In Peninsular Malaysia, the monthly minimum wage will increase from US$ 223 (RM 900) to US$ 248 (RM 1000), which is an 11 percent increase in the monthly minimum wage. In Sabah, Sarawak, and Labuan, the minimum wage will increase by 15 percent from US$ 198 (RM 800) to US$ 228 (RM 920). Exceptions to the minimum wage increase will, however, be applied in the case of apprentices and domestic servants. Failure to comply with the new law will result in a fine of up to US$ 2,544 (RM 10,000) and possible jail time. Fines will be increased for repeat offenders. Regarding its impact on regional competition, the wage hike will not substantially change the current dynamics in the ASEAN fold. Malaysia will simply continue to have higher labor costs within the region – well above Laos, Myanmar, Cambodia, and Vietnam. 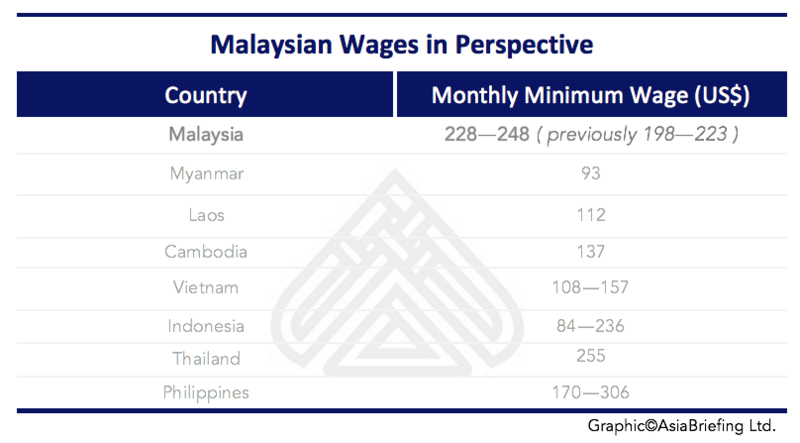 The increase in Malaysian wages means that the country’s minimum labor costs are now comparable to Thailand and within the higher range in Indonesia. More important than regional dynamics are the implications of the new law for the Malaysian economy. When Malaysia’s initial minimum wage came into effect in 2013, nearly 2 million workers immediately benefited. However, even in the current financial climate, with rising costs of living and the relatively new Goods and Services Tax (GST) in place, Malaysia’s main industries will not get substantially affected. As it is, producers within the manufacturing industry pay wages that are above the new minimum wage, and increasingly rely on capital intensive manufacturing methods. Yet, protection from rising wages will not be uniform across the country. The automotive industry, for example, may see more significant ramifications as a substantial portion of its workers are compensated at a rate that will now be below the new minimum wage.